The Lambda LS is a stand-alone illuminator consisting of a xenon-arc lamp, lamp housing, cold mirror and power supply in a single enclosure. 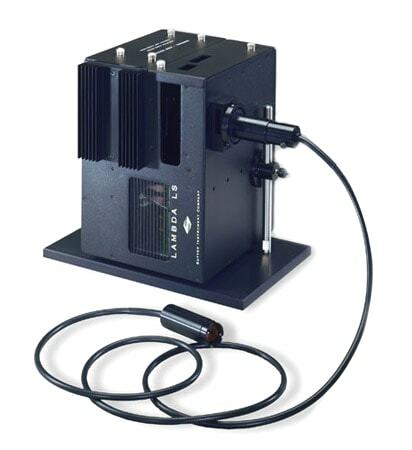 The Lambda LS is designed to be used with a liquid light guide which transmits remarkably flat, intense, illumination to the optical train of the user’s microscope or other instrumentation. The lamp’s cabinet accommodates a standard Sutter Instrument filter wheel that slides easily in and out of a slot in the light path. If desired, a second filter wheel can be mounted on the outside of the cabinet. When used with appropriate adapters, the light guide output is compatible with most common microscope systems. Unlike the arc lamps used with most fluorescence microscopes, the 175W xenon bulb is pre-aligned using a parabolic mirror and does not require alignment, focusing or collimation. In the standard configuration, the Lambda LS bulb is capable of producing light output from 340nm to a cutoff of 700nm determined by the cold mirror. An optional enhanced UV bulb produces output much lower into the UV (cut off near 200nm). As with any UV generating light source, the optional bulb generates significant quantities of ozone and must be used in an adequately ventilated environment. The Lambda LS utilizes a compact design, which places power supply, lamp house, arc lamp and cold mirror in a single enclosure. This system eliminates a common failure associated with standard arc lamp designs; when using a remote power supply aging may lead to a decreased ability to light the lamp due to loss of the insulating characteristics of the lengthy high-tension line. As with all our equipment, the power supply has been designed to minimize electrical noise that can be picked up by physiological recording equipment. Xenon lamps provide light levels which exceed those of standard microscope fluorescence lamps. Equipped with a cold mirror to eliminate IR heating of down stream optical components. Compact stand-alone lamp housing-power supply enclosure. Pre-aligned bulb eliminates common focusing problems. Integrated hour meter for convenient monitoring of lamp life. Modular construction allows use of optional liquid light guide for flexible direction of light output. Easily accommodates Sutter Instrument 25mm filter wheels within the body of the lamp. Can be coupled via a liquid light guide to many standard microscopes (Nikon, Zeiss, Leica and Olympus). Microscope coupling requires special adapters (not included); please see the adapter section in this catalog.